If you do not know French illustrator Marc Boutavant yet, you are definitely missing something! He is very famous in France and slowly but surely, his work is starting to get published in the UK. 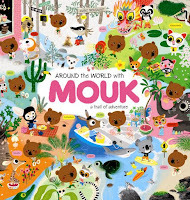 Mouk the little bear decides to sets off around the world on a journey to discover other cultures. 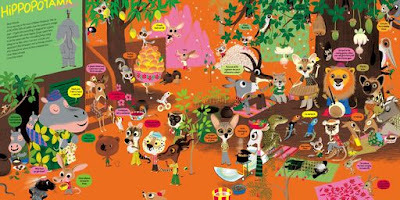 There are eleven countries depicted on double-spreads, using some of the most vibrant colours you are likely to come across in children’s illustration today. 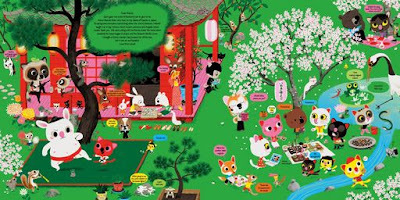 The illustrations are very busy, crammed with hundreds of tiny details (think Richard Scarry but way cooler, and yet with a slight retro look) which children will spend ages pouring over. 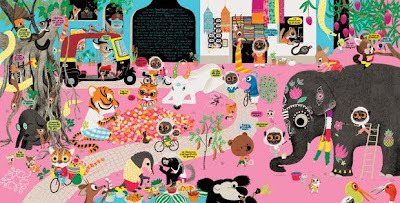 The great thing about this book is, that through the real cool, fun format of the picture book, children will learn a lot about other cultures. And if all this was not enough to convince you to run to the closest bookshop to get a copy, let me tell you another fantastic thing about this book: STICKERS! Oh yes! It comes with a set of stickers, and not just any type of stickers, but reusable stickers, to help you decorate the pages of the books with extra bits (all the pages are plastified, another great point as it is literally nearly indestructible). A definite must-have picture book! Love these books. They remind me of J Otto Seibold! Oooh, don’t know J Otto Seibold, will have to look it up!